Reception hours: 9:00 - 14:00 & 17:00 - 23:00. No smoking inside facilities, only on rooftop. It is a place where you feel at home as we provide free wifi, 24/7 hot showers included eco-friendly hand soap & shower gel, fully equipped kitchen facilities & bunk beds designed to achieve total privacy. The hostel has perfect accommodation. 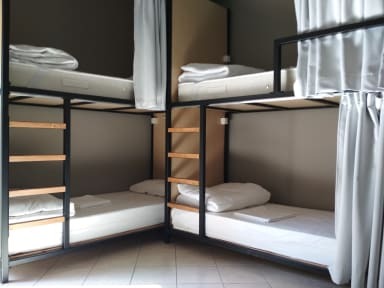 We provide dormitories of 6 or 8 bunk beds, mixed or female with similar types of bed. Our friendly staff at the reception will supply you with great info and suggestions about the best destinations & tips while being in Heraklion. As we are located in the city center, Heraklion's harbor & the main bus station is only 10 to 15 minutes walking distance as well as Heraklion International Airport & the beaches around the city are easily accessible by (free) public transportation. Getting around the island is easy as well, the main bus station is a 10 minute walk, with departures to all major destinations in Heraklion, such as Knossos, Faistos, Hersonissos, Matala, Archanes etc. as well as the airport and the other major cities in Crete including Rethymno, Chania, Agios Nikolaos. Our hostel is perfectly situated in the heart of Heraklion city center & at the same time in a peaceful and secure area with easy access to all shops, bakeries, coffee shops, bars within 50 meters walking distance. There is free public transportation to Amoudara Beach & the coast of Heraklion as well! The Venetian harbor is 5 minutes away and it is an ideal place to watch the sunset after visiting the archaeological museum or the Palace of Knossos. The nightlife and the greatest restaurants the city has to offer is right outside our doorsteps! If you need to drop you luggage at the hostel before check in time, the reception opens at 9:00. Payment upon arrival by credit card, debit card or cash. A great stay! Staff were very helpful particularly with helping me sort out a Skype interview while I was there. Heraklion is a great city and the hostel is well located. Would definitely recommend! Super friendly staff, clean and new facilities, and an amazing rooftop terrace. Great place! Beds amazing & private with curtain, light, outlet. Rooftop deck will be amazing. Maria & family very kind. Very nice kitchen. Bathrooms acceptable, plenty of showers & toilets to go around. Nice big lockers. Good location near center & supermarket very close. Met many nice guests. it looks very new and modern and the staff is incredibly friendly. We liked the dorms with the little curtains and private light (although it could be a softer light... this one was quite harsh and bright). The kitchen is really nice to cook in and we enjoyed the seating area on the roof! Really cool. The toilet and shower area needs a bit of improvement. Thank you for a nice stay! The hostel is in a great location in Heraklion and is extremely clean. The staff was amazing and the kitchen and dining area was very nice. Free coffee every morning and a really nice rooftop hangout. I would definitely stay there again. This is a great clean new hostel with pod style dorm beds (curtains, personal lights and power points) and hot water and big lockers. There is also air conditioning in the dorms - a must even in late September. The staff are friendly and helpful. One of the best hostels we’ve stayed in in Greece, we would definitely stay here again. Very friendly and helpful staff. Great location and close to many restaurants, cafés, the local bus station, and a supermarket. Spacious lockers for bags, but no lock on the girl’s dormitory room. Girls showers need improvement. Otherwise, good value for the price. Decent hostel with a good setup, not enough bathrooms for the amount of people that can stay there. The kitchen looks new and is quite big, the roof area is cozy with a small bar, tables and lounge chair. It was pretty slow when I was there, but I imagine in peak season it could be a cool social hostel. Very clean, centrally located and comfortable. I did however have an issue with an older woman who may be the owner(?) She was incredibly rude and INSISTED I pay in cash. Just a very rude woman who definitely made her illegal business practices my problem. So, be sure to bring enough cash!